Home News Rumors Smartphones Xiaomi Xiaomi Set to Unveil Mi Mix 2S on March 27! Xiaomi Set to Unveil Mi Mix 2S on March 27! 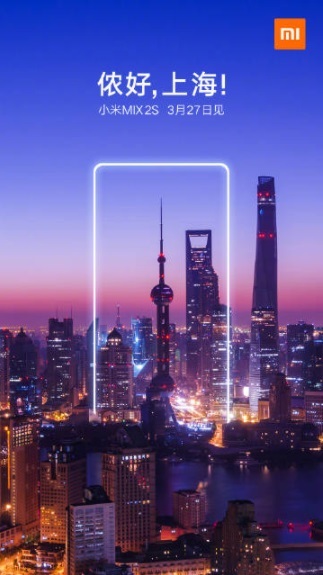 Xiaomi has posted an e-invited in Weibo to announce the official launch of the Mi Mix 2S slated on March 27! The e-invite didn’t reveal much about the upcoming flagship smartphone, but it appeared like the device will likely boast a bezel-less design. If rumors are right, the Mi Mix S2 will sport a huge 5.99-inch display that has a small notch on its upper right corner. The notch is said to house its front shooter. Under the hood, it might feature Qualcomm Snapdragon 845 processor, and could be coupled with 8GB of RAM and 256GB of internal storage. Moreover, the device is expected to offer dual rear cameras.